Years of frustrating unanticipated reciprocating compressor failures have lead to the development of the new line of IMI Reciprocating Machinery Protectors. We have learned that the proven successful methods of condition monitoring on rotating equipment do not yield good results on reciprocating devices. IMI has developed the RMP product line to detect impacts caused by looseness of internal parts. Depending on the amplitude of the impact and how many times the impact occurs within a specified time window, the appropriate 4-20 mA signal is provided. The industry leading USB Programming capability makes it easy to match the RMP to any reciprocating application. For properly running machinery, the IMI RMP allows you to trend peak acceleration data. So what do those programming options mean? This brief document takes a quick look at the variables used to calculate the severity of the impacts the Reciprocating Machinery Protector detects. Download our model 649A USB programmable Reciprocating Machinery Protector programming software. 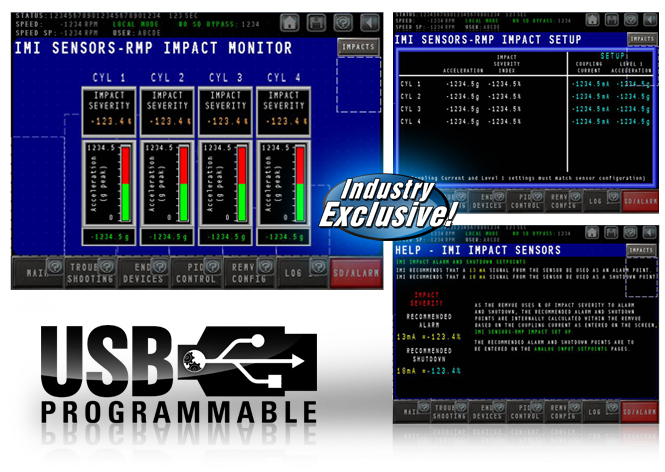 Brochure details IMI's groundbreaking series of USB programmable vibration sensors. Learn about our smart 4-20 mA vibration transmitter, bearing fault detector, reciprocating machinery protector and vibration switch.